Oh great… another photo sharing social network. And this one must by fly-by-night because the icon is a black camera stamp on a white background. Well, actually, it’s ‘the’ place to share if your serious about photography and expanding your ideas through the work of others. The simple entry just keeps the kids away. EyeEm is a photo social app I had on my iPhone for a month before actually setting up a login. Now, it’s the place I go first for a fresh perspective. There isn’t pages and pages of self face shots or images to just get high ranking. Sure, there will be a few of those, but mostly it is folks from around the world that are there for the same reason, to try things and share. The same as other options is the list of filters you can apply to a image, the difference EyeEm brings is the way you tag each photo by the Topic, Place and Event. So, you can quickly find a particular type of photography image to view one or many images in that group. A an app to use to be inspired by others with a like mind. 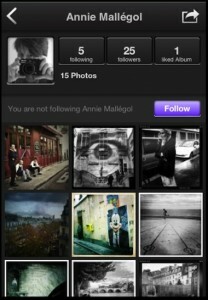 No, that isn’t me… just someone who has a nice group of pictures that says how I see the app. EyeEm does have a Web page interface too that you can log into via your desktop.